This is a Kreutz sungrazer, a fragment of the same ancient comet that produced sungrazing Comet Lovejoy in Dec. 2011. According to comet expert Karl Battams of the Naval Research Lab in Washington DC, “Comet SWAN is one of the brightest Kreutz-group comets ever observed by SOHO, although not quite as bright as Comet Lovejoy.” Battams forecasts a peak magnitude of -1 for Comet SWAN, while Lovejoy was three magnitudes brighter at -4. Will Comet SWAN survive its plunge through the sun’s atmosphere as Comet Lovejoy did? Probably not, but experts also said Comet Lovejoy would not survive, and they were happily wrong. 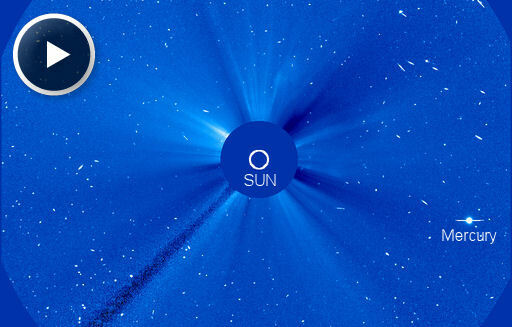 Comet’s SWAN’s closest approach to the sun will likely come on March 14th. That was a coronagraph image from the Solar and Heliospheric Observatory (SOHO). The many speckles and streaks are energetic protons striking SOHO’s onboard digital camera. Stronger radiation storms (S4 to S5) can fill images like these with “snow,” rendering them useless for normal operations. The current storm will probably subside later today and restore SOHO’s clear view of the sun. The Solar and Heliospheric Observatory (SOHO) and NASA’s STEREO-B spacecraft detected a CME rapidly emerging from the blast site: movie. Analysts at the Goddard Space Weather Lab say the leading edge of the CME will reach Earth on Jan. 24 at 14:18UT (+/- 7 hours). Their animated forecast track shows that Mars is in the line of fire, too; the CME will hit the Red Planet during the late hours of Jan. 25. 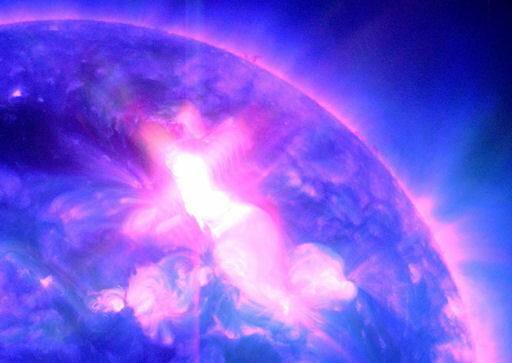 RADIATION STORM IN PROGRESS: Solar protons accelerated by this morning’s M9-class solar flare are streaming past Earth. On the NOAA scale of radiation storms, this one ranks S3, which means it could, e.g., cause isolated reboots of computers onboard Earth-orbiting satellites and interfere with polar radio communications. 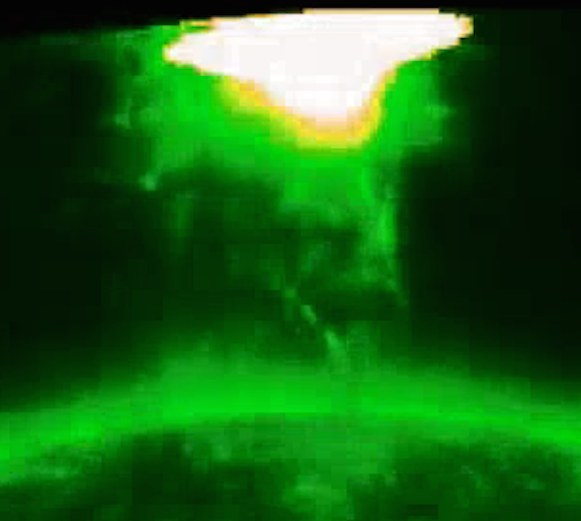 An example of satellite effects: The “snow” in this SOHO coronagraph movie is caused by protons hitting the observatory’s onboard camera. Since it was launched in 2010, SDO has observed many “entangled eruptions.” Active regions far apart but linked by magnetic fields can explode one after another, with disturbances spreading around the stellar surface domino-style. Saturday’s eruption appears to be the latest example. 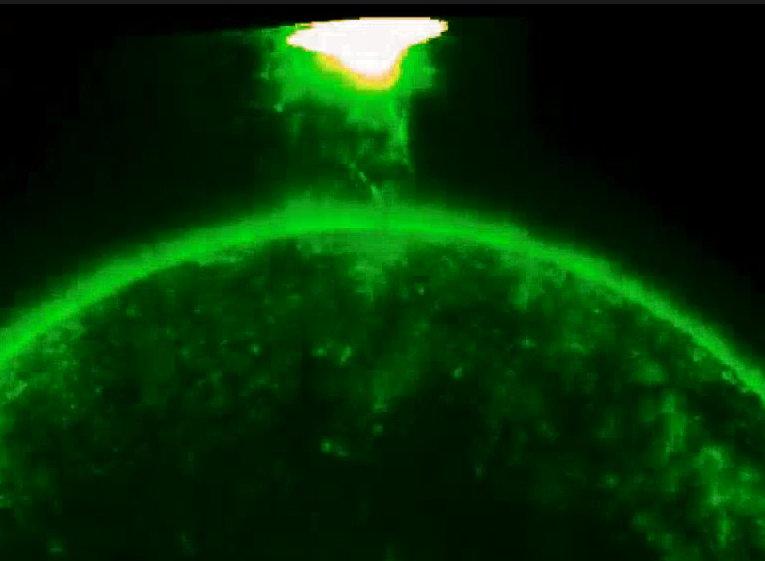 The part of the eruption centered on sunspot 1305 hurled a coronal mass ejection toward Earth. The relatively slow-moving (500 km/s) cloud is expected to reach our planet on Oct. 4th or 5th, possibly causing geomagnetic storms when it arrives. High-latitude sky watchers should be alert for auroras. NASA’s MESSENGER spacecraft is in orbit around Mercury, so it will have a front row seat for the impact. 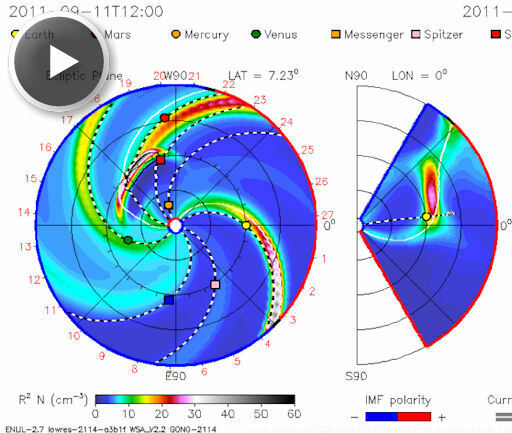 Researchers are keen to learn how Mercury’s magnetosphere responds to CMEs. In particular, they wonder if CMEs can overpower Mercury’s magnetic field and sputter atoms right off the planet’s surface. 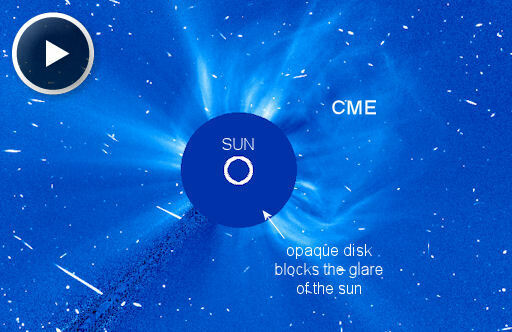 Thanks to the Goddard forecast, MESSENGER’s controllers know the CME is coming, and they can prepare to observe the impact. Interplanetary space weather forecasting is a new thing. 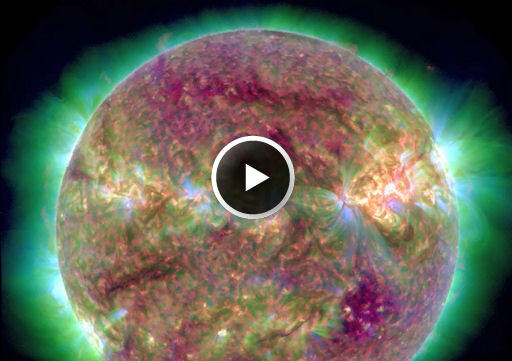 It became possible in 2010-2011 when NASA and ESA spacecraft surrounded the sun. Working together, SOHO, the Solar Dynamics Observatory, STEREO-A and STEREO-B now have the entire star under surveillance. 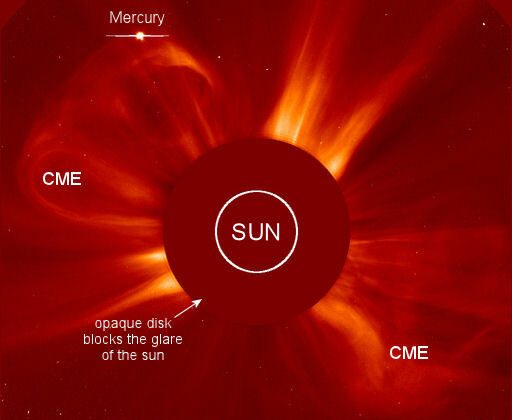 CMEs can be tracked no matter where they go, which means space weather isn’t just for Earth anymore.